Successfully Added Xiaomi Redmi Note 6 Pro Global version 3GB 32GB Snapdragon 636 Smart Phone Black to your Shopping Cart. Dual camera dual side, 12MP(1. 4μm 2PD)+5MP rear camera, 20MP+2MP front facing camera with selfie flash. 6.26" notch 19: 9 FHD+ full screen display, immersive viewing esperience. Qualcomm SD636, new 14nm Octa-core, faster and exceptional running performance. Low power consumption W/4000mah big battery, giving the smart phone a long standby time. 3GB 32GB Smartphone, enough storage room for you to store your favorite files and videos. 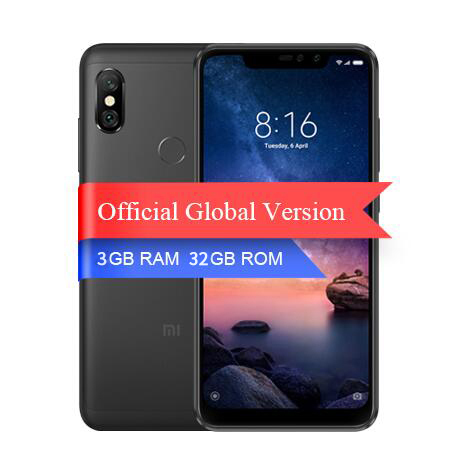 Xiaomi Redmi Note 6 Pro is optimized for use with the Qualcomm Snapdragon Processor 636 Octa core architecture with 14 μm for a solid performance and perfect use experience. 4000mah big battery, for longer use time, no worry of getting power off while you're outside. Keeps you get in touch of friends and family when you are not around. Selfies with 20 + 2 MP dual Front Cameras. Dual Rear Cameras 12 + 5 MP with autofocus and dynamic with the Dual Pixel. Full Screen of 19: 9 with its design of decorative lines and Curves provides a Broad vision and fits perfectly in your hand.